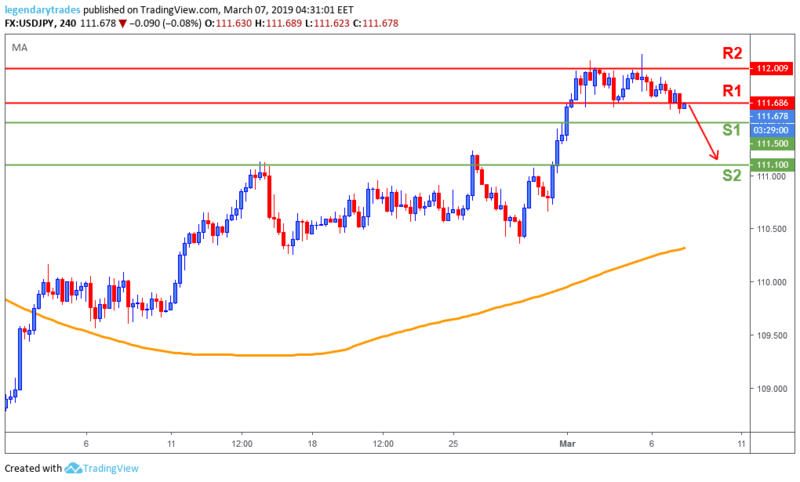 The USD/JPY remained in the same range as Tuesday’s trading session as a consequence of soft US data and global equity markets pulling back. If stocks extend their losses during today’s session, we then expect further weakness on this pair. Earlier this morning, Japan released the Leading and Coincident indexes for February, but it didn’t have any major impact on the Dollar/Yen. The Dollar/Yen broke below 111.70 confirming a possible further weakness towards 111.50 (S1). A break below that level, the pair will likely reverse back to the mean 111.10 (S2) support level. However, a close above 111.70 will put this potential downward move on hold for now.